One thing that might stand out when we look back at 2014 is the rise of interpolated content. We’ve become used to translating around auto-correct errors in texts and emails but we seem to be at a tipping point where software is going ahead and rewriting content rather than prompting you to notice and edit things yourself. iOS doesn’t just highlight or fix typos, it changes the words you’ve typed. To take one example, iOS users might use ‘ill’ more than they use ‘ilk’, but if I typed ‘ilk’ I’m not happy when it’s replaced by an algorithmically-determined ‘ill’. As a side note, understanding the effect of auto-correct on written messages will be a challenge for future historians (much as it is for us sometimes now). And it’s not only text. In 2014, Adobe previewed GapStop, ‘a new video technology that eases transitions and removes pauses from video automatically’. It’s not just editing out pauses, it’s creating filler images from existing images to bridge the gaps so the image doesn’t jump between cuts. It makes it a lot harder to tell when someone’s words have been edited to say something different to what they actually said – again, editing audio and video isn’t new, but making it so easy to remove the artefacts that previously provided clues to the edits is. Photoshop has long let you edit the contrast and tone in images, but now their Content-Aware Move, Fill and Patch tools can seamlessly add, move or remove content from images, making it easy to create ‘new’ historical moments. The images on extrapolated-art.com, which uses ‘[n]ew techniques in machine learning and image processing […] to extrapolate the scene of a painting to see what the full scenery might have looked like’ show the same techniques applied to classic paintings. But photos have been manipulated since they were first used, so what’s new? As one Google user reported in It’s Official: AIs are now re-writing history, ‘Google’s algorithms took the two similar photos and created a moment in history that never existed, one where my wife and I smiled our best (or what the algorithm determined was our best) at the exact same microsecond, in a restaurant in Normandy.’ The important difference here is that he did not create this new image himself: Google’s scripts did, without asking or specifically notifying him. In twenty years time, this fake image may become part of his ‘memory’ of the day. Automatically generated content like this also takes the question of intent entirely out of the process of determining ‘real’ from interpolated content. And if software starts retrospectively ‘correcting’ images, what does that mean for our personal digital archives, for collecting institutions and for future historians? Interventions between the act of taking a photo and posting it on social media might be one of the trends of 2015. Facebook are about to start ‘auto-enhancing’ your photos, and apparently, Facebook Wants To Stop You From Uploading Drunk Pictures Of Yourself. Apparently this is to save your mum and boss seeing them; the alternative path of building a social network that don’t show everything you do to your mum and boss was lost long ago. Would the world be a better place if Facebook or Twitter had a ‘this looks like an ill-formed rant, are you sure you want to post it?’ function? So 2014 seems to have brought the removal of human agency from the process of enhancing, and even creating, text and images. Algorithms writing history? Where do we go from here? How will we deal with the increase of interpolated content when looking back at this time? I’d love to hear your thoughts. Posted on 11th December 2014 17th March 2015 Categories History, TechnologyTags digital heritage, digital history, social software, technology6 Comments on The rise of interpolated content? Somehow it’s a month since I posted about my CENDARI research project (in Moving forward: modelling and indexing WWI battalions) on this site. That probably reflects the rhythm of the project – less trying to work out what I want to do and more getting on with doing it. A draft post I started last month simply said, ‘A lot of battalions were involved in World War One’. I’ll do a retrospective post soon, and here’s a quick summary of on-going work. First, a quick recap. My project has two goals – one, to collect a personal narrative for each battalion in the Allied armies of the First World War; two, to create a service that would allow someone to ask ‘where was a specific battalion at a specific time?’. Together, they help address a common situation for people new to WWI history who might ask something like ‘I know my great-uncle was in the 27th Australian battalion in March 1916, where would he have been and what would he have experienced?’. Match its author with a specific regiment or battalion. Send in the results via this form. If you know of a local history society, family historian or anyone else who might be interested in helping, please send them along to this post: Help collect soldiers’ experiences of WWI in their own words. Template talk:Battalion – what information should be recorded on every battalion/unit page? Template talk:Infobox command structure – what structured data should be recorded about military hierarchies? Template talk:Infobox theatre of war/doc – what structured data should be recorded about a unit’s activities and engagements in the war? Template talk:Infobox military unit – what structured data should be recorded about a battalion/unit? You can see the infobox structures in progress by flipping from the talk to the Template tabs. You’ll need to request an account to join in but more views, sample data and edge cases would be really welcome. Populating the list of battalions and other units has been a huge task in itself, partly because very few cultural institutions have definitive lists of units they can (or want to) share, but it’s necessary to support both core goals. I’ve been fortunate to have help (see ‘Thanks and recent contributions’ on ‘How you can help‘) but the task is on-going so get in touch if you can help! Finally, last week I was in New Zealand to give a keynote on this work at the National Digital Forum. The video for ‘Collaborative collections through a participatory commons‘ is online, so you can catch up on the background for my project if you’ve got 40 minutes or so to spare. 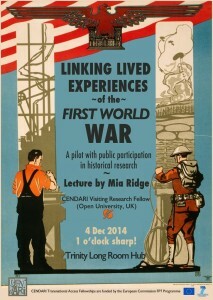 Should you be in Dublin, I’m giving a talk on ‘A pilot with public participation in historical research: linking lived experiences of the First World War’ at the Trinity Long Room Hub today (thus the poster). 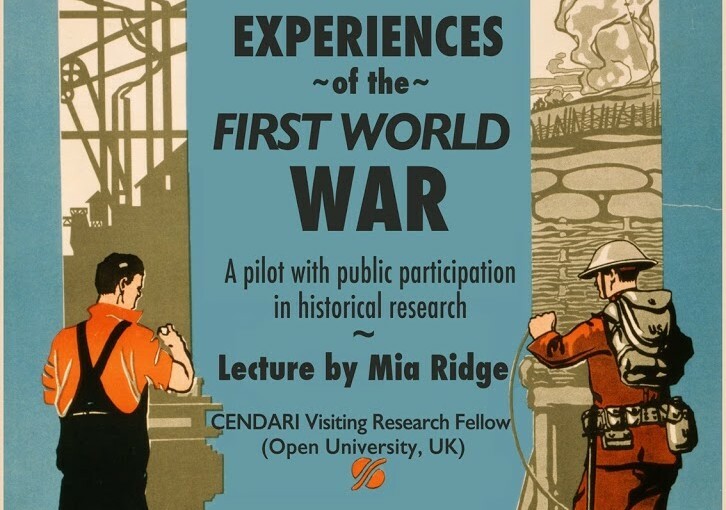 And if you’ve made it this far, perhaps you’d like to apply for a CENDARI Visiting Research Fellowships 2015 yourself?